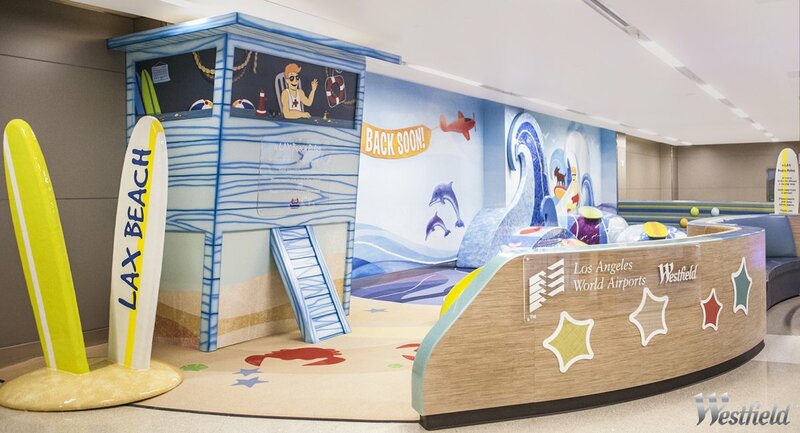 (Los Angeles, California) Just in time for the busy holiday travel season, a children’s play area named “LAX Beach” has opened in the New Tom Bradley International Terminal (TBIT) at Los Angeles International Airport (LAX). LAX Beach celebrated its opening by hosting a “birthday party” for the space, featuring nearly 50 kindergarten children from nearby Playa Del Rey Elementary School and six LAX therapy PUPs (Pets Unstressing Passengers). 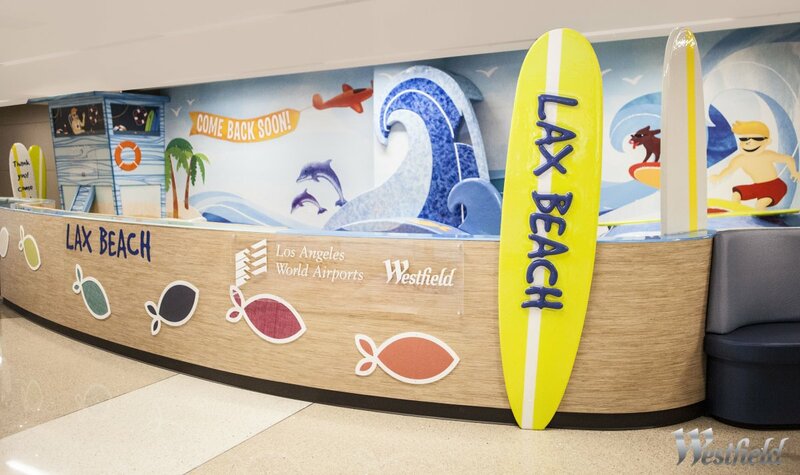 Located past federal passenger security screening to conveniently serve travelers awaiting flights, the 971-square-foot LAX Beach provides fun for children ages 2-8. The space is composed of hand-painted, soft, sculpted foam pieces resembling beachscapes such as waves, surfboards, beach toys and sea life – a nod to TBIT’s unique architecture inspired by the Pacific Ocean on the airport’s west side. 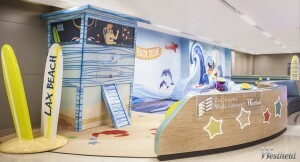 LAX Beach features a slide and equipment for children to climb on and “ride.” Adjacent seating overlooking the area offers a place for guardians to relax and watch their children. LAX Beach is located near the dining terrace in the terminal’s Villaraigosa Pavilion (Great Hall) and is open during terminal hours. Westfield, the terminal concessions developer and manager, designed and created the $350,000 play area, which was paid for by Los Angeles World Airports and manufactured by Playtime, LLC. 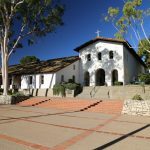 No money from the City’s general fund was used. The play area becomes part of Westfield’s world-class dining and retail collection in the New TBIT that features over 60 new premier shops and restaurants – including 22 Los Angeles-based brands – cutting-edge design and dazzling amenities. • A dedicated section for children’s books at Relay and The Economist. 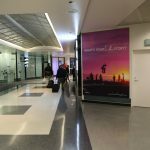 The more than 30 airlines at Tom Bradley International Terminal served 8.6 million international travelers in 2012, or 50 percent of LAX’s overall 17 million international passenger volume. 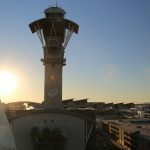 LAX is the sixth busiest airport in the world and third in the United States, offering 680 daily flights to 96 domestic cities and 930 weekly nonstop flights to 59 cities in 30 countries on 63 commercial air carriers. It ranks 14th in the world and fifth in the U.S. in air cargo tonnage processed. In 2012, LAX served nearly 63.7 million passengers, processed over 1.9 million tons of air cargo valued at over $86.9 billion, and handled 605,480 aircraft operations (landings and takeoffs). 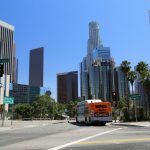 An economic impact study in 2011 reported that operations at LAX generated 294,400 jobs in Los Angeles County with labor income of $13.6 billion and economic output of more than $39.7 billion. This activity added $2.5 billion to local and state revenues. LAX is part of a system of three Southern California airports – along with LA/Ontario International and Van Nuys general aviation – that are owned and operated by Los Angeles World Airports, a proprietary department of the City of Los Angeles that receives no funding from the City’s general fund. For more information about LAX, please visit www.lawa.aero/lax or follow us on Twitter @LAX_Official, on Facebook at www.facebook.com/LAInternationalAirport, and on YouTube at www.YouTube.com/laxairport1. As part of its global portfolio, The Westfield Group (ASX Code: WDC) designs, develops, owns, manages and leases award-winning shopping venues in landmark cities around the world. Among the company’s iconic retail destinations are Westfield London and Westfield Stratford City in the U.K.; Westfield San Francisco Centre and Westfield Century City in Los Angeles. 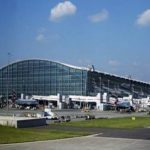 Operating in eight major U.S. airports, Westfield is raising the bar on the traveler experience with developments at JFK, Newark, Houston Intercontinental and Chicago O’Hare airports. Upcoming Westfield world-class retail icons include Westfield World Trade Center (opening in 2015) and Westfield Milan in Italy.